This wine app is different. 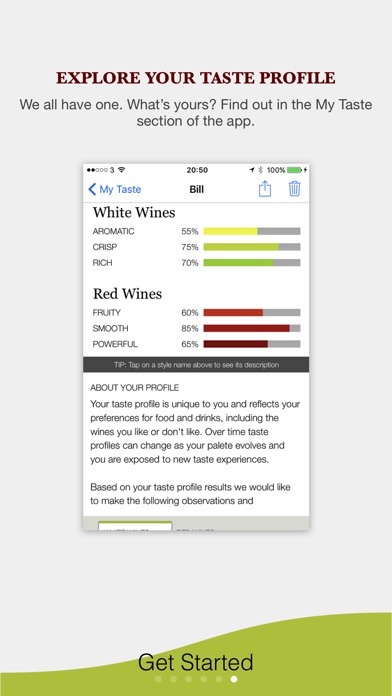 Would you like a wine app that puts you and your wines centre stage? Pocket Wine takes you on an exploration of wine styles and grape varieties by giving you an insight into wine that has taken others years to achieve. The app also provides you with a professional means to record your wine journey and manage your wine cellar. 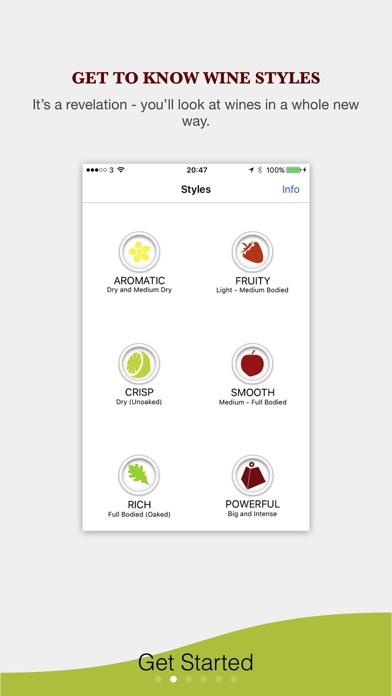 The app will automatically integrate your wines into the appropriate styles and grape varieties. As your wine repertoire grows, so will the app, and more importantly so will your knowledge and enjoyment of wine. At the end of the day, the only ratings or reviews of wine that really matter are your own. With knowledge comes understanding and after using the app for a little while every wine store you walk into will become an Aladdin’s Cave with many hidden treasures. Please note that Pocket Wine does NOT review individual wines or try to sell you wines. The app is dedicated to maximizing your enjoyment and understanding of wine, while also providing a professional platform to record your wine experiences and manage your cellar. •	Get to know wine styles – it’s a revelation •	Gain an insight that has taken others years to achieve •	Explore the world’s most important grape varieties and blends •	Save and record your wines in a professional manner •	Master food pairing – it’s easier than you think •	Discover your personal taste profile. Unlock the complex world of wine and download Pocket Wine today – it’s free! Features: •	Investigate all 6 table wine styles. •	Explore 42 of the world’s most important grape varieties and blends. 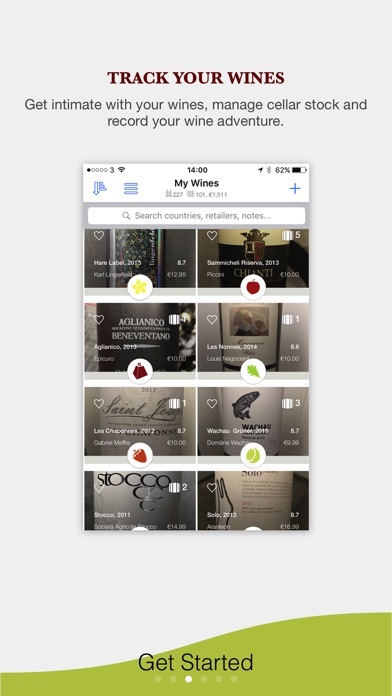 •	Add your wines to the app – save as many photos as you like for each wine. •	See cellar stock and value for every style, grape variety and search result. •	Search your wines by style, country, producer, retailer – any way you like. 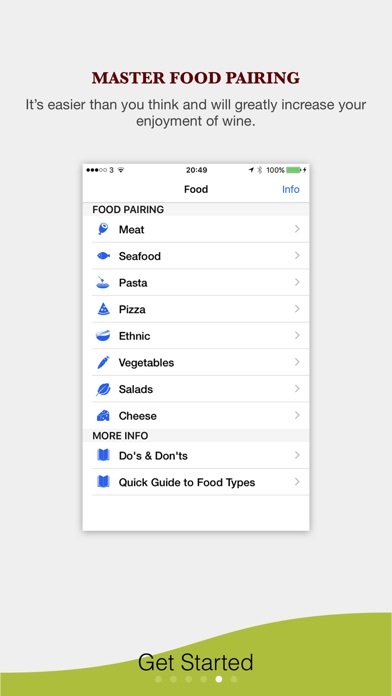 •	Find food pairing matches for hundreds of meal types. •	Access food pairing guides for all food types. •	Discover your personal taste profile and profile your friends. •	Share your wine experience with friends via Facebook, Twitter, Gmail and Contacts. •	Your wines will automatically be added to the relevant grape variety. •	View your wines in standard or tiled view. •	Save your wines to Favorites and Wishlist. •	Note: you may only save a limited number of wines to the free version – upgrade and add as many as you like. 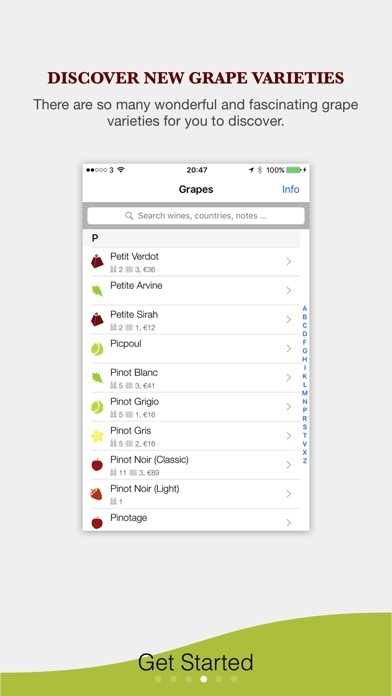 Get Pocket Wine Pro and unlock the app’s full features and potential: Unlock All Grape Varieties This will greatly expand your wine knowledge and understanding - there are so many fascinating grape varieties just waiting to be discovered. Save Unlimited Number Of Wines Add as many wines as you like – review, rate and add them to your cellar. As your repertoire grows, so will the app. Ideal ‘Wine Collection’ Platform Record and manage your collection in an intimate, accurate, informed and professional manner. Add To All iOS Devices Upgrade once and download the app to all your iOS devices – it’s designed specially for iPad as well as iPhone. Sync and Backup Sync across all your iOS devices and backup / restore your wine collection. Pocket Wine is probably the best investment you can make in wine. Enjoy! Thorough descriptions, great pairing ideas, a “my wines” section for remembering your faves, and fantastic customer support. For knowledge, understanding, food pairing and as a wine journal. I add all the wines I buy to this app. It's great having a record of how much I paid, where I bought them and how I rated them. It's also so handy to see what's in my cellar. The app works as absolute treat and it's so easy to use. Paid option is worth it! I am the order writer for the wine section at a Trader Joe’s and this app has been invaluable! From the information on obscure grapes including the regions they grow in to the very detailed food pairing list, the app has been very helpful in my own personal search to discover new wines as well as help others find their new favorite. The app is perfect for people you just fall in love with wine and want to learn everything but do not know where to start from. It covers basic pillars, we’LL organized and simply enjoyable to use! Nice way to collect and organize! PROS: I like that I can upload from photos. Like how many pieces of info are categorized. -it makes sorting by different things easy. Dislikes: Could be more auto-filled sections/ drop down menus. -I taste a lot of wine and it’s a bit of effort to take pics and type in each section. Started saving my wines here and it's great. No sign in, no annoying requests, no emails, just the tools I need on wine information and to record all my favorite bottles in a nice format. Started saving my wines here and it's great. No sign in, no pushy requests, no emails, just the tools I need on wine information and to record all my favorite bottles in a nice format. Wish more apps were like this. A lovely personal wine journal and cellar app with excellent information on grape varieties - has introduced me to many great discoveries. A great find. I downloaded about every wine app there is for a good grape / wine style guide. This is the only one that had all the info I need. Also, the flavor test is spooky accurate and really helpful with its reccomendations!